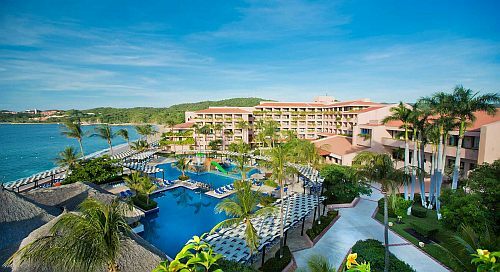 Sunwing Vacations has dropped the price of a 1 week all inclusive package (flight, hotel, transfers, all meals, all drinks) from Calgary to the Barcelo Huatulco in Huatulco, Mexico down to $880 CAD (per person) including taxes. The Sunwing flights from Calgary to Huatulco included with the package are non-stop both ways. However, Sunwing is known for sometimes changing their flight plans to include a stop. 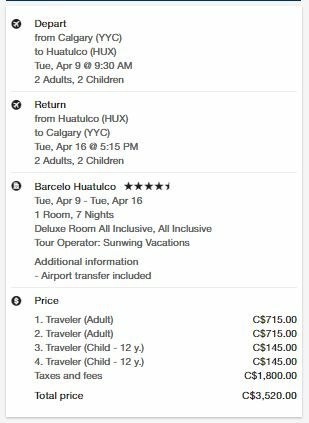 In this example, Sunwing is offering the Barcelo package for $1165/person if it's just 2 adults, and if you do all the math, you can see that each 'free child' is *really* an additional $595.